Our regular old notarized and signed marriage certificate from Texas was enough to be considered legally married in Canada. But Finland requires an apostille, which is an international document certifying marriages, births and deaths. Now that I have it, the paper seems meaningless in its offical-ness. But I was denied social insurance because for Finland, I wasn’t considered married without the apostille. When I first arrived in Finland the apostille was still traveling to Finland from Texas via Montreal via Colorado. I have since registered the apostille with the magistrates office, so I hope that I am now considered married in Finland! I was able to appeal my denial by providing copies (using the free photocopier available at the Kela office!) of my new magistrate office registration, the all important apostille, our marriage certificate and finally my employment contract. Phew. Helpful note: if you need an apostille, call the Secretary of States office where the event took place. Order one right away. Also? 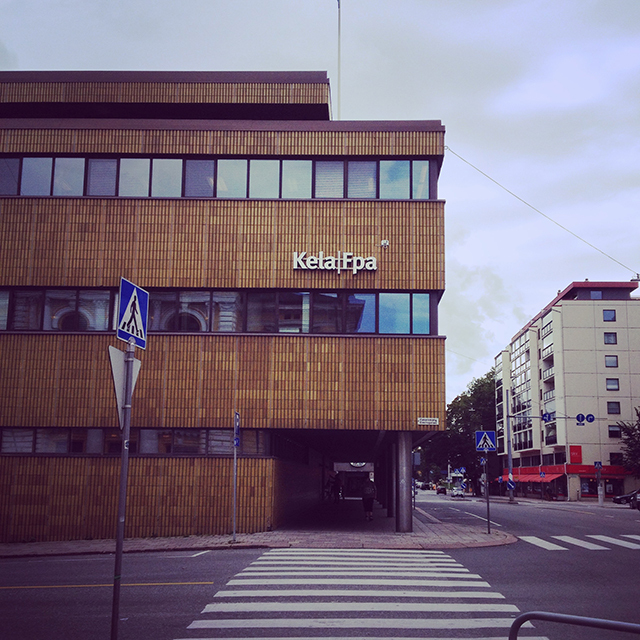 There are some ugly 1960s buildings in Turku, but the Kela office is the ugliest building in the city. Hands down.